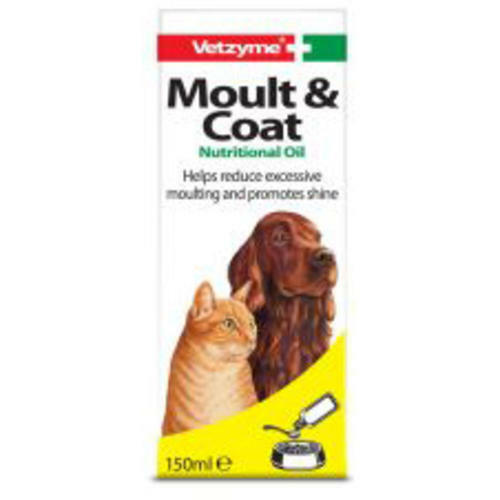 Vetzyme Moult & Coat is a liquid formula that is used to reduce excessive moulting and promote a glossy coat. Suitable for use on cats and dogs, it contains a unique combination of natural oils high in Omega-6 fatty acids. Omega-6 helps to keep the coat in great condition and helps to protect it from outside elements. •	Keeps fur balls at bay. •	Helps keep skin and coat in tip-top condition. •	Great for use during the summer months when moulting is at its peak. •	Suitable for puppies over 12 weeks of age.